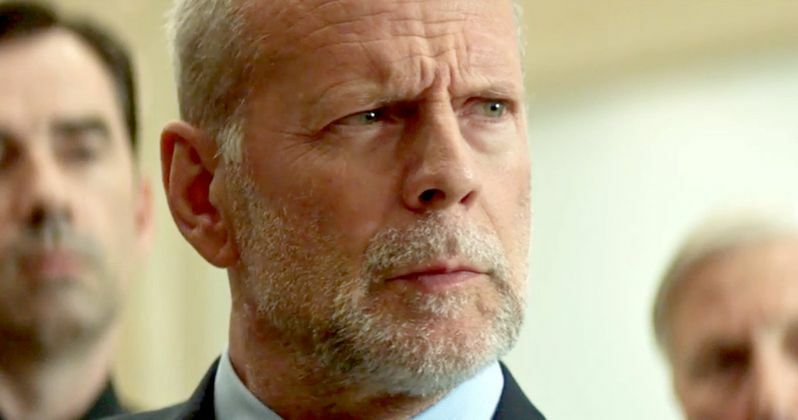 After teaming up for last year's Extraction, action icon Bruce Willis is reuniting with director Steven C. Miller (Silent Night) for this year's action-thriller Marauders. Lionsgate Premiere will bring this explosive new movie to theaters and on demand formats starting July 1. Today, we have our first glimpse at Marauders with the trailer and poster. Bruce Willis stars as the owner of a bank who gets embroiled in a deadly conspiracy. Christopher Meloni, Adrian Grenier and Dave Bautista chase down the truth behind a string of robberies surrounding Bruce Willis' banking empire in the new trailer for Lionsgate Premiere's Marauders, which debuted on YouTube today. This action-thriller is all about putting together the pieces to reveal the greater conspiracy! The movie will go up against Disney's The BFG, Universal's The Purge: Election Year, Warner Bros. The Legend of Tarzan and Sony's The Shallows. When a bank is hit by a brutal heist, all evidence points to the owner and his high-powered clients. But as a group of FBI agents dig deeper into the case - and the deadly heists continue - it becomes clear that a larger conspiracy is at play. Meloni, Grenier, Bautista and Willis lead a cast that also includes Johnathon Schaech, Lydia Hull, Tyler Jon Olson and Texas Battle. Steven C. Miller started his career with the indie horror film Automaton Transfusion, and he has quickly emerged as a go-to genre director. His other film credits include Scream of the Banshee, The Agression Scale, the Silent Night remake, Under the Bed, Submerged and last year's Extraction. We'll have to wait and see if this filmmaker will team up with Bruce Willis for a third time. It isn't known how wide a theatrical release Marauders will get when it hits theaters this summer, but the film will be readily available on VOD formats from the comfort of your own home. We'll be sure to keep you posted with more updates and footage from Marauders as we get closer to its release, exactly one month from today. Until then, take a look at the trailer and poster for Marauders below.